Perhaps one of the trickiest things about buying a flashlight online is not knowing how the beam will look until it arrives at your door. Fortunately, with a little bit of knowledge, you can get a pretty good idea of the beam pattern your flashlight will produce just by reading the manufacturer specifications. Keep reading for our beginner’s guide to flashlight beam profiles and learn what makes the difference between flood and throw. When you shine a flashlight against a wall or other smooth surface, you’ll quickly notice two major areas of the beam profile. 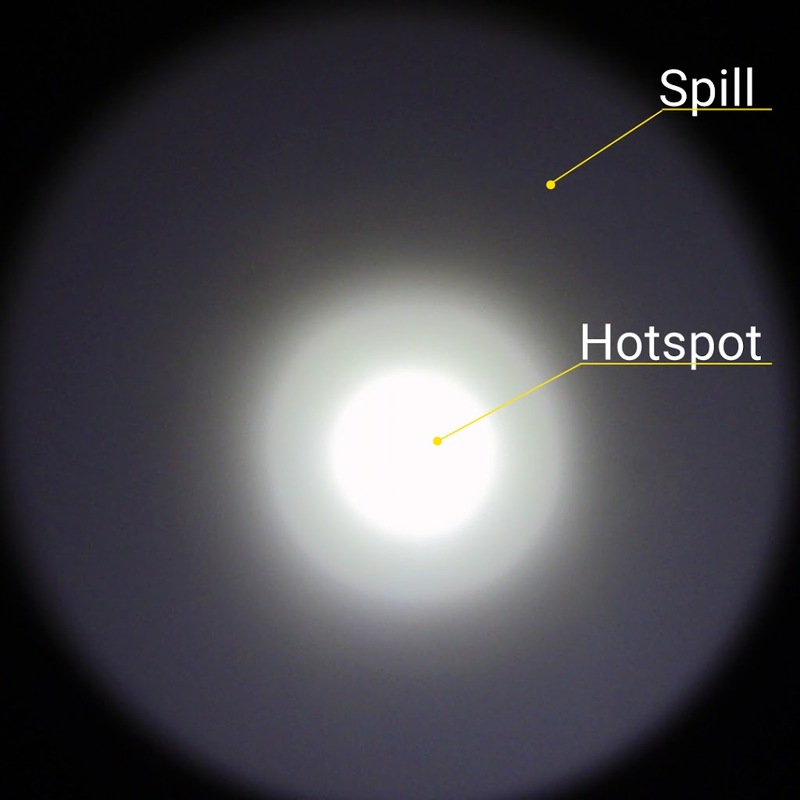 In the center of the beam is a circle of intensely bright output known as the hotspot. 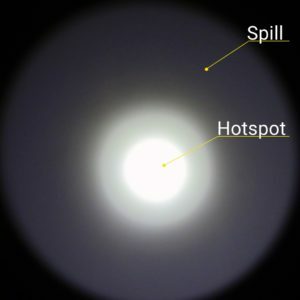 Surrounding the hotspot, you’ll find a larger area of light known as the spill. This light will be noticeably dimmer than the hotspot and may form in a series of circles or a smooth wash of light depending on the flashlight reflector. If you’ve read through different flashlight reviews, you’ve most likely come across these two terms repeatedly. In the flashlight world, flood refers to the area illuminated by the flashlight. When someone describes a flashlight as “floody,” they’re referring to a wide-angle beam that’s able to wash a surface in a smooth “flood” of light. These flashlights are great for up-close reading and general usage for their ability to evenly light up a space. On the flip side, you’ll often hear flashoholics talk about a flashlight that is a “thrower.” Here, throw is referring to the ability of the flashlight to project light at a distance. As you can guess, throw flashlights will have a very intense and focused hotspot that can be seen at greater distances. Some of the best throw flashlights are rated for distances well over 10 football fields long. Throwers are frequently the torch of choice for hunting, tactical, search, and law enforcement for this reason. Now that you have a grasp on the different parts of a flashlight beam and the basic terminology, let’s look at what determines the beam profile in the first place! With flashlights, it’s all about the reflector when it comes to beam profile. A general rule of thumb to follow here is the more elongated and deep a flashlight reflector is, the more throw distance will be possible. For a more floody beam, you’ll want to stick with a flashlight that uses a more shallow and wide reflector. Otherwise known as Smooth, you’ll see these reflectors on throw flashlights and other flashlights with a very focused center. As you can guess, the surface on these is polished smooth like a mirror. More common on everyday carry, general use and flood lights, OP stands for orange peel because of the texturing given to the reflector and its similarity to an orange peel. OP texture helps to smooth out light artifacts and creates even lighting. Sometimes you’ll see designations such as LOP (light orange peel) and MOP (medium orange peel) which further describe the amount of texturing detail. What about a TIR Lens? 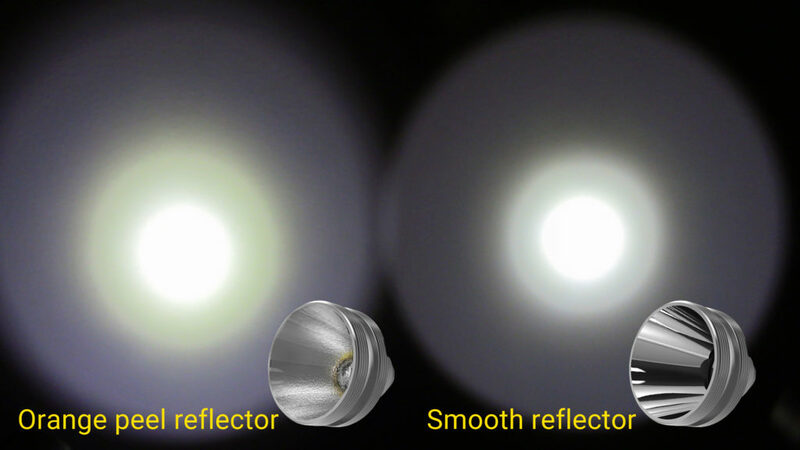 In addition to the reflector, a flashlight’s lens will also have an effect on the beam profile. In fact, some flashlights rely heavily on lens shape to control the beam pattern. You’ll see these flashlights labeled as TIR (total internal reflector) optics or TIR lens and can be identified by the patterning such as a conical focus or textured surface. A TIR lens gives additional control over the light and can create diffused, wide and even oval beam patterns! Flashlights that rely on the reflector shape to produce the desired beam pattern will feature a flat lens, often including anti-glare coating and ultra clear properties to maximize light output as much as possible. This last one might seem obvious, but the LED itself will also have an effect on a flashlight’s beam profile. While some LEDs are designed to maximize the total lumen output, others are engineered to support high intensity applications. CREE, one of our favorite LED suppliers, designates their brightest LEDs with HD (high density) and the most intense LEDs with HI (high intensity) at the end of the model names. For example, the CREE XHP35 HD is featured on some of our brightest flashlights like the Concept 2, while the CREE XP-L HI V3 has been a perpetual upgrade on our GT (Grand Throw) flashlights. Cool post! I think the TINI has a TIR lens right? The new MT21C is pretty wide beam too. Might want to add about the corona the transition between the spot and the spill.